Duxbury Pier Lighthouse Near Plymouth, Mass. Marking the entrance to Plymouth Bay, just outside Plymouth Harbor. Accessible for viewing by many harbor cruises, whale watching, or excursion boats leaving out of the harbor. 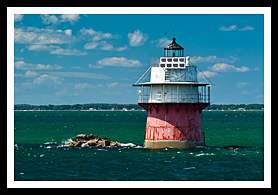 Duxbury Pier Lighthouse was the first offshore cast-iron caisson lighthouse built in the United States, warning mariners of a dangerous shoal off Saquish Head. It is three stories high and is commonly referred to as a “coffee pot” for its appearance. Often times it is referred to as the “bug light” for various reasons. One of these, is with an abundance of lobsters in the cool waters surrounding the light, these crustaceans were often described as "bugs" by mariners. With the lighthouse's often cramped quarters and isolated living outside the harbor, keepers would often comment the lighthouse was driving them "buggy." Fred Bohm was Keeper between the 1930’s and 1940’s and was known to have saved 90 people from drowning, including a large group of girl scouts within one year. One memorable event occurred around suppertime where gale force winds were blowing in from an impending storm. A woman was caught in the fierce winds and her boat capsized. As she tried to swim to the lighthouse for safety, she got caught in what is referred to as "devil-tail" seaweed near the lighthouse. Bohm heard her screams and witnessed her struggling. He launched his boat but noticed the seaweed was pulling her under, so he quickly threw off his clothes and dove in to save her .He reached her unconscious body and brought her to the shallow water by the lighthouse where he could feel a pulse. He also noticed her bathing suit had been removed in the struggle. At first, she wouldn't respond to his attempts to revive her, then suddenly she awoke, and was quite startled for not having her clothes. Her first words were "Where are my clothes?" he explained "I don't know, but you are lucky to be alive," and explained to her what had happened. He wrapped her up in borrowed clothes and brought her safely to shore around midnight that night. In the winter of 1942, Bohm and a friend were rescued from a nearby lobster man when his own boat capsized. Luckily both men survived the frozen waters, but Bohm lost two fingers from frostbite. Dorothy Bicknell, daughter of renowned historian and New England's lighthouse "Flying Santa" Edward Rowe Snow, has been President of Project Gurnet and Bug Lights Inc. She and her group of volunteers have been taking care of Duxbury light and Plymouth's Gurnet light for many years and is in the process of seeking stewardship from the government as part of the National Lighthouse Preservation Act program. This allows permanent ownership of the lighthouses by the community. Capt John Boats cruises by Duxbry Pier Light on one of its whale watching or fishing tours. Plymouth Harbor Cruises passes by the lighthouse as part o their Plymouth Harbor tours in a Mississippi style paddlewheel steamer. Duxbury is primarily a quiet residential historic community that was settled by the Pilgrims. Duxbury Beach Park, known as one of the most beautiful beaches in Massachusetts, is open to residents and non-residents alike with permits. Snug Harbor on Duxbury Bay, just north of Plymouth Bay, is one of the most attractive recreational boat basins on the Massachusetts coast. Plymouth is New England’s oldest and most historic town dating back to when the Pilgrims landed on Plymouth Rock. Visitors will find plenty of historic narrated tours at the Plimouth Plantation Museum (correct pronunciation Plimouth of the period), which provides a recreation of life in a 17th century outdoor English village, a Wampanoag Tribe home site, rare animals, and a Grist Mill used to grind corn. 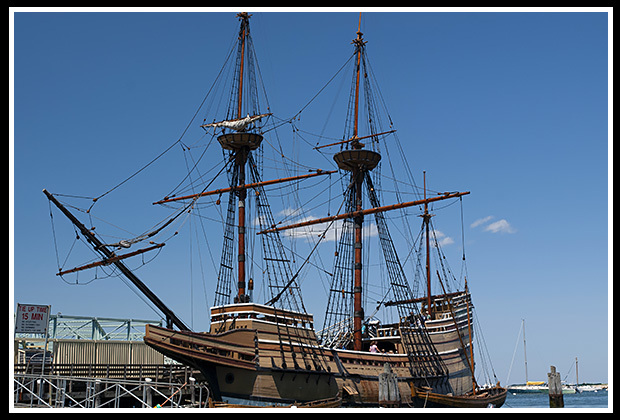 Of course, there is also an authentic replica of the Mayflower, the recently restored Mayflower II to visit. Check out the Plymouth ghost tours, and you can use the Plymouth Rock Trolley for a different touring experience. There are many fine beaches, specialty shops, and all kinds of recreational activities to enjoy here. As one of the most famous towns in America, Plymouth has many attractions like its museums for visitors to learn about America's beginnings, and you can walk up to the National Monument to the Forefathers, which is the largest solid granite monument in the US. For those who enjoy tasting at wineries, you'll find three in the Plymouth area, the 1620 Winery, the Plymouth Bay Winery, and the Plymouth Colony Winery. Boat cruises below offer many types of cruises. While some may offer specific lighthouse cruises, some will pass by specific lighthouses as part of charters, narrated wildlife and historic tours, ferrying passengers, whale watching, fishing tours and other types of excursions. Contact info is provided to help you plan your special trips to New England’s shorelines. Enjoy! Cruises in Plymouth Harbor aboard the Pilgrim Belle, a Mississippi-style paddle wheeler that operates in the summer season. Plymouth to Provincetown ferry, or whale watching cruises may pass by the lighthouse. 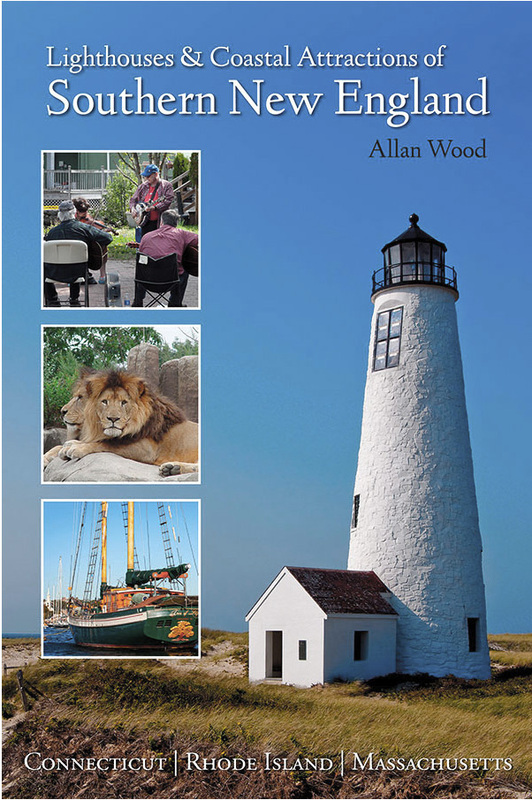 My new book, Lighthouses and Coastal Attractions of Southern New England: Connecticut, Rhode Island, and Massachusetts, published by Schiffer Publishing, provides special human interest stories from each of the 92 lighthouses, along with plenty of indoor and outdoor coastal attractions and tours, with contact info to plan your vacation.